Provide comfort for the family of Theresa Lukaszewicz with a meaningful gesture of sympathy. LUKASZEWICZ, Theresa (nee Soda) of Blasdell, NY, December 29, 2018. Devoted wife of 47 years of the late Stanislaw Lukaszewicz. 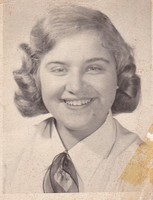 Cherished and honored mother of Christine and Anna Lukaszewicz; Beloved daughter of the late Martin and Clementine (nee Wall) Soda; Loving sister of Gloria Campoli (late Thomas), late Edward (Louise) Soda, and the late Martin Jr. and Sophie Soda; great-aunt of Marc Campoli; also survived by many nieces and nephews. Family will be present to receive friends Wednesday from 2-8pm at the (Blasdell/Lackawanna Chapel) JOHN J. KACZOR FUNERAL HOME, INC. 3450 South Park Ave. where prayers will be said Thursday morning at 9:45 followed by a Mass of Christian Burial at Our Lady of Victory Basilica at 10:30AM. Please share condolences at www.kaczorfunerals.com. To send flowers in memory of Theresa Lukaszewicz (Soda), please visit our Heartfelt Sympathies Store. The Gelz Family sent flowers to the family of Theresa Lukaszewicz (Soda).